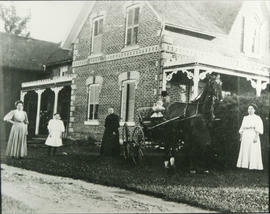 Ella (Margaret Luella), Wesley, his mother Matilda (Switzer Adair) visiting relatives on occasion following the death of her daughter Laura in child birth. 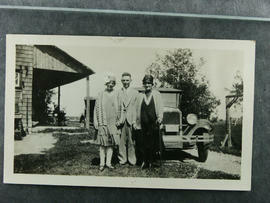 1927 Chevrolet touring top with side curtains and wooden spoke wheels in the background. Audio of Mike Asselin's first interview on February 20, 1974. The interview discusses his upbringing, specifically working with his father as a young man. See the Related Descriptions below for the summary. Audio of Mike Asselin's second interview on May 2, 1974. The interview discusses his upbringing, specifically working with his father as a young man. See the Related Descriptions below for the summary. Contains photographs and information on the Belfry family and cemetery, located between Lowes Gate and Noble Drive on Line 8. 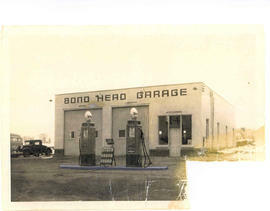 The garage in Bond Head. This garage was built by Ron Grimshaw. An interview featuring Stan Brown at the Scotch Settlement Historic Group, recorded by George Jackson. It is based on Stan's family history. An interview with Irma Burton, recorded by George jackson at the Scotch Settlement Historical Society Meeting at the Auld Kirk. Irma discusses her family history based on the Hughes and Gibbs families.